While most food experts purport fresh food as the healthiest choice, research suggests that trend may be shifting at least slightly. While fresh food is among the healthiest, a new group of foods has been identified as equally beneficial – fermented foods. Fermentation is a process that allows foods to steep, converting natural sugars and carbs into bacteria-boosting agents with a variety of health benefits. Fermentation is considered one of the oldest forms of food preservation; however, this process does more than preserve food. During the process, food is exposed to bacteria and yeast that stimulate the growth of microorganisms. This exposure allows the beneficial microorganisms to overtake the harmful ones, resulting in a nutrient rich food. The process often results in interesting flavors, textures and smells, but the benefits of these foods far outweigh these differences. Common fermented foods include sauerkraut, kefir, pickles, yogurt, misa, kimchi and others. Almost any food can be fermented to render healthful benefits; however, some foods are used more often than others. Kombucha, sauerkraut and yogurt are among the most common and most healthful fermented foods. These foods render specific health benefits and should be incorporated into the daily diet. Kombucha is a carbonated or fizzy, fermented black tea. This beverage offers a variety of healthful properties and is considered one of the most powerful fermented foods. As it contains between four and seven microorganisms in each bottle, kombucha helps build an especially strong gut and immune system. More than just a New Year’s tradition, sauerkraut should be a part of the regular diet. In essence, the common topping is fermented cabbage that has a strong effect on overall health. Regular consumption of sauerkraut has been tied to increased brain health and diminished depression and anxiety, likely because a tremendous connection exists between the health of the brain and the gut. Basically any form of yogurt is considered a fermented food; however, not all yogurt is created equal. Greek and regular yogurt are dairy forms, which makes them more acidic and harder to digest. Coconut yogurt is likely one of the best forms to consume regularly, but yogurt in any form delivers a powerful punch of enzymes and probiotics to the diet. While few realize it, the gut is actually the center of the immune system. As such, consuming fermented foods directly improves health and readily treats a wide range of conditions. Continue reading to learn tips from Earth Clinic readers who have used different fermented food and drink to heal their ailments! I have been making fermented vegetables and milk Kefir for a couple of months, and I think it's good for me, but I truly hate the sour taste. I really have to force myself to eat it. I have tried to add Stevia and other things to camuflage the sour taste, but without luck. How much should one eat a day? Hi Bill, I was wondering what your thoughts are about consuming fermented foods when following candida diet? would the supplements that are recommended on your candida protocol also kill off the good bacteria? thanks for all your help on this awesome site. Hi Healthseeker… Fermented foods are useful in an anti-candida protocol — but only in the later stages of a cure. When you start any good anti-candida protocol, this will initially involve heavy detoxing of heavy metals, halides(Chlorine, Bromine and Fluorine) as well as other poisons from the candida itself. These poisons will continually be dumped into the intestines every day causing perhaps diarrhea problems and the like. This is not the best environment to help re-populate you intestines with good bacteria. That’s why its probably best to take the fermented foods or lacto and bifido bacteria after you have actually detoxed and gotten over your Herxheimer or die-off reactions. The gut will then not contain so much candida or poisons and will stand a much better chance of being re-populated with beneficial bacteria quickly. Hello everyone. I wanted to post a link to Dr. Mercola’s website on “How Gut Bacteria can have Profound Implications on Your Health”. It’s what Lisa, and so many others have tried to explain how important it is to our overall health. I really didn’t get “how” important until I listened to the video tape that’s with the article. She is a scientist and all I can say is “Wow”…. what an eye-opener. And, at years end, I want to say “Thank you” to everyone here who contributes to sharing their knowledge of health issues and especially to this website and staff who give all of us an opportunity to reach out to each other and make a difference. Fascinating talk by Bonnie Bassier.. thanks for posting Sue! Along the same subject, I posted this a while ago but will do again. If you forward to the 44minute mark, Dr’s talk how they perform a bacteria transplant (poop transplant) to heal neuralogical disorders (MS) and other ailments. Fascinating science that is gaining recogntion.. Thanks so much for posting the radio link Rob! I had NO idea of what doctors/scientists were doing in that area. So informative! Amazing what we can find out if we read and listen. Lisa, I wanted to give you an update on my Chinese herbs. I have stopped taking them. I have always had digestive issues in one form or another my whole life…. Which lead to constipation, skin conditions, sensitive stomach, etc. , etc. With so many markers being put in front of me, (this forum, books and articles) I now believe that I don’t have the necessary “good” bacteria for my body to function in a natural way. My first indication was taking oil of oregano. I started taking it for prevention of cold sore outbreaks, but what I found was that my skin was “quieting” down and I had more energy and felt a general sense of contentment. So, that lead me to thinking that maybe I had some kind of bacteria going on in my gut that was causing my issues all along. Hence, more reading. I have been replacing my gut flora with fermented foods and just ordered some kombucha. I’m a work in progress. Will keep you updated, but I hope/think I’m on the right path. Never knew just how important our guts/flora is. Thanks guys. Hi Sue M. , So glad to hear from you. I have continued with my Chinese herbs and am seeing very good results. I understand though where you’re coming from. I’m glad you have discerned the source of your issues. As you know from so many of my posts, I’m a big proponent for fermented foods. I learned about all this about 3-4 years ago and have spread the word on this ever since. I have made my own kefir, both raw milk and coconut, kombucha, fermented veggies and kimchi. About 5 months ago I invested in a fermenting crock which sits on our counter. I hope you have the chance to make your own fermented goodies. It’s actually fun. Also, you may want to look at the body ecology site to learn about healing the gut and also getting the good bacterias in. There are lots of great recipes there which I have used. Something you can easily get ahold of is Bubbie’s pickles and/ or sauerkraut which are in the regular grocery store and are truly fermented as oppossed to other products of the same kind. I always keep jars of them in my fridge as back up so I don’t run out. If you get them, remember to also drink the juice since it’s loaded with good bacteria. Anyway, welcome to a whole new world! Thought I’d give you a link to Sandor Katz since he’s a rock star in the fermentation world! He always has lots of great info. I have found that I have great results with taking some Colloidal Silver. Don’t take more than 3-4 teaspoons a day, divided dose. You may be able to work up to taking more than that but I have never been able to take unlimited amounts without it also seeming to kill off the good bacteria as well as the bad. I have read of people saying they cured themselves of Candida when they didn’t know they weren’t supposed to drink it like it was water. I’m afraid to try it in copious amounts as my body is terribly sensitive. I also find [acidophilus tablets] to be a good gut restorer for me. If you have gas, indigestion, or rectal itching you may find that a good acidophilis supplement will fix those issues. If they don’t, try a good vegetarian enzyme product. That enables me able to eat beans, cabbage, and sweet potatoes with little or consequences. I still have a problem with milk but the enzymes help when I do decide to have some ice cream. Best of luck! Ted mentioned once that to consider all soy sauce an amino acid supplement, since they are fermented rich in amino acids and eat all your food with it. It will instantly increase the bioavailability of all the foods you eat. And your food suddenly becomes “chelated” increasing the biovailability of most anything. Shall I eat it direct from the bottle with food or use in cooking? Which has more benefits? thanks a lot. I tried this successfully and had to share. 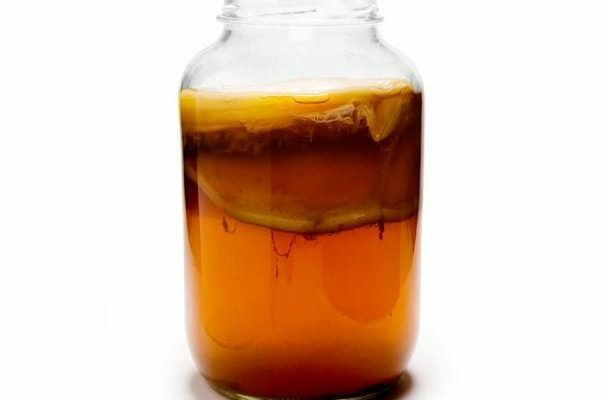 So much easier and cheaper making this at home to make your own Kombucha versus paying $20 upward for a SCOBY. http://www.gutsense.org/gutsense/flora.html Please go to this site to get info. I am attempting to reestablish my gut flora with cultered buttermilk enemas and by eating probiotic foods. After many yrs of abuse, the use of an alcoholic beverage such as wine, beer or even liquors like brandy, rum, bourbon have seemed to be almost completely erased by conventional medicine and now our many other natural remedies. The Apostle Paul recommended “from now on drink a little wine for your frequent ailments”. The Scottish Christian writer George MacDonald dramatized the medicinal use of wine as a daily beverage and the use of Scotch or Bourbon for emergency use as in shock or coma in his novels. Perhaps Vinegar is the one step further not only in distillation, but also health benefits. Anyway this is a good topic starter. Personal testimony. When I was not quite 16 yrs, my brother and I elected to help a farmer harvest hundreds of bales of hay. It was the middle of summer with temps soaring in proly low-to-mid 90’s. We (plus several other lads) began probably around 4:00 PM and worked hard until just before dark and farmer grilled up a bunch of burgers and we woofed em down and went back to work much refreshed. We “hauled hay” until almost 11:PM enduring the extreme exhaustion of the intense labor. The ride home was like comatose; the loss of electrolytes, lactic acid build-up and extreme fatigue was to the point of barely able to stretch a leg or clasp the hand. But the group was young & daring and not ready to go home on a Friday night, so we headed to the border for some packaged Beer. (I cannot recall exactly, but this was at least one of the first, if not the first time I had drank a full can of beer. ) The thirst and exhaustion was such that I downed 2 cans of beer in about a short 20 minutes drive back home. When I got out of the car, BOOM! I was a new man. No longer sore or exhausted, I felt like I could haul a few hundred more bails of hay or hang out late in the night. It was a feeling as profound as the losing of sexual virginity. Historically we know that alcohol has strong adaptogenic properties, but unfortunately, the medicinal use has all but disappeared in modern western world. Perhaps there are some good articles or books on this subject. Any positive testimonies from Earth Clinic members??? Hi Gavin, my ginger beer is doing well! This time I left it fermenting for almost a week, like they advise on a recipe from the Reunion Island. Then they say one should filter it and let ferment for another two days. Is that correct? After that I will cool it but how much time can I keep it? Does it go off? A few days ago I opened it after shaking and oh boy, it almost exploded! I did it because nothing seemed to be happening inside of the bottle but yes….. A lot was going on! Hi francisca.. I think the rule of thumb is to filter it through a muslin cloth, after the yeast has done its thing. Then transfer it into two litre plastic bottles, and before capping put a teaspoon of sugar in. Leave for a few days, cool and then drink. At the bottom of the main fermentation vessel is all the good stuff (fractionated DNA) save that in the fridge and take a bit each day. I have a small bottle in the airing cupboard and am recharging and taking a sip each day from the bottom.. My eyes are definiatly improving I keep forgeting to put the glasses on in the morning.. I’ll up the dose when it warms up a bit. If I squint a bit my vision is ok.
Talking about Ginger lol.. Ive been chopping up a good cubic centimeter or pheraps more putting, it in a cup and pouring hot water over it untill its covered.. About a third of a cup. Placing the saucer over it and leaving for about twelve hours. Then strain, and decant into another cup.. Then when the wife is ready to go to bed I pour a capfull of ACV. In and add a teaspoonfull of honey. Steeping the ginger in hot water for an hour or less isnt enough. She drinks this and then goes to bed…. She is sleeping really deeply and is starting to look the picture of health. Before leaving for an hour, and making the ginger tea, didnt have the same effect. It quite remarkable. She has no problem taking the ACV this way. This makes a really pallatable tea. Thanks for all the advice, Gavin, I am going to filter my ginger beer straight away. And great advice too about the ginger tea….. I have been sleeping really badly and I am not a picture of health at the moment, I am going to make it right away. When I make ginger tea I only steep it for maybe 10 minutes but I am going to try this now! 3 big O. Tomatoes (dipped in boiling water for 5 seconds, cut an “X” on the bottom and peel from there, cut in half and dig your fingers in to get the seeds out. Then finely chop. Please note that a food processer makes this a fast job. Add juice from 3 lemons, 1 tablespoon of sea salt, and 1/4 cup whey ( you can get whey from straining plain yogurt through a coffee filter… what remains is a greek style yogurt and the liquid whey). Mix this all together (not the yogurt) and put it in a quart size mason jar (keep the mixture about an inch from the rim of the jar) and seal with an air tight mason lid- the metal one, not plastic). Let it sit on the counter top for 2-3 days at room temp (colder needs the longer time), then refrigerate. This is the basic recipe from Sally Fallon’s NOURISHING TRADITIONS. Also check out her fermented lemon recipe- it is great on fish… Though my 7 year old son likes to eat it right out of the jar! Hi, we bought a yogurt maker yesterday and made our first batch last night. Great yogurt, I must add, although I normally don’t even like yogurt. Maybe some of you have tips that will help us make creamy, delicious yogurts…… We tried plain ones, with added pineapple (a mistake as the milk curded)and added strawberries (better but the milk still curds). I think that if you compote the fruit with a tiny little bit of sugar maybe the milk won’t curd (I did that and added to the plain yogurt, a treat! ). And, does anyone know whether one can add cream to the milk to make them creamier? I didn’t find much useful information on the Internet but I learnt that one can flavour them with spices like cinnamon or vanilla. I suppose one can also melt chocolate au bain-marie and add a bit of cream so that it doesn’t harden when you add to the milk mixture? Any ideas will be welcome as I need to eat yogurt to aid my digestion! 2.pour 1 gal. Milk into cp— (I use a gal. Cos we like it and I substitute it in recipes calling for sour cream, soups, baked potatoes, cold salads req. mayo etc. 3. turn crockpot on high for 1.5hrs. or low for 2.5hrs.—this step kills bacteria should heat up to 170 degrees. 5.after 3hrs. Take lid off and add starter with a wisk BLEND THOROUGHLY. if you can stick your pinkie finger w/o too hot, it will culture probiotics just fine don’t let it get too cool either. 6. put lid back on and cover with a heavy towel for< 9 hours. > longer if you prefer more sour. 7.this next step is optional. You can leave the yogurt as is and add fruit/honey/oatmeal/raisins/banana/ whatever you like. DO NOT ADD WHILE MAKING YOGURT OR IT WILL NOT WORK. this step yeilds the greek yogurt–approx. Half a gal. And a half a gal. Of whey protein. That is also loaded with probiotics. You can add a little sweetener and drink it. Some people reboil the wp and make ricotta cheese. xtra straining yeilds yogurt cheese. I’ve tried the coffee filters, cheese cloth ect. But didn’t like the outcome as the coffee filters disintegrate and the cheesecloth looses some of the yogurt into the whey protein. A clean t-shirt cut to fit the collander is best. The way I wash after use is to put into sink w/ boiling water, few drops of soap, and a 1/4 c. Bleach. use tongs to handle while washing then throw into dryer til next time. First time I made this I assumed it would take the 2 weeks to help my digestion as the advertised yogurt who shall remain nameless. within an hour of consuming it, I had to run to the bathroom, yeah! Also, using whole milk will obviously yeild more greek yogurt but it is so rich I only eat a couple of tablespoons at a time. easy on the pocket book as well. 1 gal. Of milk ( with store prices for yogurt , whey protein and cheese) can yeild consevatively $20-$28 USD, not a bad deal huh! Hope this helps. It takes longer to read this than it does to actually do it. God Bless! That’s great that you are making your own yogurt! I make my own kefir and love the taste and health benefits. There is a really great website that has tutorial videos and also articles on making various fermented foods. They have info up there for yogurt as well. You’ll find it interesting. It’s called culturesforhealth.com It’s where I got my kefir grains from originally and also my Viili starter which is a Finnish yogurt. My daughter in law is Finnish/ French so I thought I would make that one since she’d told me about her love for it. Also, I drain my yogurt so that my yogurt has a heavier body. Yes, you can also use cream as well w/ the milk for it to be creamier. Homemade yogurt has about 7 different strains of bacteria in it. Of course, our gut needs the good bacterias for our health and immunity. Hope this info helps. Thanks Lisa, I will surely have a look at the site you mention. As I think that I said I actually hate the taste of yogurt and I don’t drink milk either, never! But the yogurt with fruits is really excellent and somehow, although a lot of people complain that their yogurt is thin (I suppose this is the reason you strain yours) mine is very thick, like a pudding (I left it in the machine for 10 hours and used full fat milk with an Activia yogurt). Maybe you can answer this question as well, a friend of mine told me that her doctor said that you should eat the yogurt after the sell by date as the culture then will be a lot better. Have you ever heard of this? That would mean that you can keep yogurts for a lot longer which would be good for my own starter yogurt as we travel a lot and I won’t be able to use it always within a week. 2)add whatever type of yoghurt you want to use as a starter (1 small pot). 3)Whip in powdered milk , a little gelatine or agaragar powder makes it thicker. 4)Pour mixture into warmed, clean preserving jars. 5)Wrap jars with an old towel and place in cupboard next to your hotwater heater, a radiator on low heat, your furnace. Temp. needs to be about 30 ° continuously. 6) Leave overnight. Next morning or when thick put lids on jars and store in fridge. Hi Francisca, That’s great that your yogurt comes out so thick right away. That can change as temperatures change. Just so you know though, you really don’t need any special equipment to make yogurt or kefir. I just make them in a jar and set it on my counter. As for what your friend’s Dr. said, yes, that is correct. The benefits become stronger as time goes by. I actually leave my kefir on the counter. I don’t refrigerate it which is how it was traditionally done from what I have learned. If you go to the kefir section here on EC you will see other posts of mine w/ links on info on kefir, yogurt and kombucha. They are all related in that they are all fermented foods/ drinks. Hope this info helps. Thanks for all your good advice once more, Lisa! I am making a new batch of yogurt as we speak, this time some plain, some with strawberries or pineapple cooked in a bit of gelifying sugar for a few minutes to see whether the acid disappears and they stay good and one with cinnamon and vanilla. They will be ready tonight! Thanks for the address to the site as well, very interesting also because of the sprouted flour they sell but we don’t have that here in Europe, unfortunately, might be quite healthy I suppose…. I have tried Kombucha in the past but I never felt any benefits, to be honest so I stopped buying it. I know you can make your own but I never dared for fear something goes wrong. Kefir I never tried but as I tend to dislike anything milky it is maybe not for me. You can buy it in the health shops here. As far as my friends’ doctor advice I don’t know anymore as I read on a site that if you buy active yogurts to use as a starter for your own they lose the amount of live bacteria as the time goes by, meaning that using your own, maybe after it has been ready for maybe 5 days would be the same. So…. Do yogurts become better with the age or do they lose the healthy bacteria? I don’t know anymore! This is how I make my yogurt these days and I’ve never had a batch not turn out good. I pour whole milk into a quart size mason jar then add 1 TBSP of plain yogurt from my last batch (or from store bought) and 1 TBSP of sugar (I use organic). Then I put a tight lid on and shake it all up real good. Then I turn on the oven light and let it set in there for two days. After that I refrigerate it, then when it’s cold I strain it to thicken (Greek). I’ve found this method, though it takes a day longer than the boiling method, to result in a thicker yogurt even before straining plus I don’t make a mess and it’s much easier to make; therefore I’m more inclined to make it. *adding the TBSP of sugar gives the culture something to “feed” on. Yesterday, talking to a friend, she told me that her doctor had told her that it is beneficial to keep yogurts in the fridge for far longer than the date suggests as they will develop beneficial bacteria. Is that true? I have really been enjoying the many benefits of making and drinking fermented drinks. Currently, I make a young coconut kefir and drink it daily. I have been doing this for about 5 months now. The one comment I do have to give though is that 2 days ago I made a batch but this time I added a bit of raw cane juice as a prebiotic. This was the second time I tried this- the first time was delicious! Well, on this second batch (in the bottle I always make it in) the cap absolutely exploded into bits in my hand. It was quite shocking! And my hand became numb and tingly. I don’t want to deter anyone from making their own fermented drinks but heed this as a warning upon opening! What I have done is put a loose fitting cap on the bottle and that seems to have solved this. Hi, just wanted to comment on cabbage juice and gas. If you read Sally Fallon’s book “Nourishing Traditions” you will see that she advocates fermenting cabbage juice for a couple of days before consumption. I tried this and while the smell was not pleasant, I had no gas at all. You will need to use whey in the process but it’s easy to produce. I would urge you all to start eating fermented vegetables regularly for intestinal flora too – highly beneficial. Hi, just needed to write to say I suffered from “bursitis” in the hip for a year and a half. Every doctor said the same thing: vicodin for the pain, advil for the inflammation, and prescription muscle relaxers for the accompanying muscle cramps, and several rounds of physical therapy. I certainly couldn’t function on the medications, and only seemed to get temporarily, mildly better. I stumbled suddenly had a craving for sauerkraut, if you can believe it, and borscht and homemade salad dressings-all foods that I usually don’t like. I am not exaggerating when I say I slept my first night pain free, and started doing the vinegar and honey concoction and simply can’t believe I feel so good, so fast! I did increase my water intact, too, to aid in cleansing my body of whatever it had, too. I just used Heinz and Sue Bee and all that pain from mid-back to knees are gone. I even did yoga today which I love but was told it was irritating the bursas-“try swimming.” How can I swim while taking vicodin and muscle relaxers?!?!? I was reading over natural cures for Acid Reflux, or GERD, and noticed no one mentioned sauerkraut. I have been using this and it does work wonders. I used to get pains like aliens eating through my body from the GERD, and the sauerkraut has helped immensely. I don’t like the taste of it, so I’m going to try a few things mentioned on this site. 2 tblsp sauerkraut 2x daily helps clear the nausea and pain for me. I noticed that saurkraut had not been mentioned for relief of acid reflux. I know that lots of german delis serve this with their meals….The fermentation of the kraut is really good for the digestive system…really helpful to decrease acid reflux. I suffered from cold sores for many years. Then I read about a cure that used sauerkraut juice to cure them. I tried it at several outbreaks and they quickly disappeared. It may be the L-lysine in the juice. They went away and have not come back for years. nay, made the skin burn and go bright red even though it was washed off immediately. In regard to sauerkraut for cold sores- did you drink this or use it topically?! It sounds like you tried it topically. I think John meant that you should drink it as a remedy for the cold sores. I make a large container of kimchee and keep it on hand when I feel my intestinal and vaginal candida starting to act up. For me, it really helps nip an attack in the bud, and seems to raise my immunity generally. It even seems to ward of a cold or any kind of respiratory infection. Here’s my recipe: Buy a big head of nappa cabbage. Coarsely dice, and steam in the microwave with a small amount of water for five minutes only. It should still be crisp. Place the semi-cooked nappa in a large bowl. Then dice and add 3 or 4 raw scallions. Grate a large carrot and then, finely dice and add 2 large garlic cloves. Lastly, grate about 2 TBSP of RAW, FRESH ginger and add. Pour on about 1/2 cup water to make a “sauce” that will distribute all of these ingredients with the nappa when mixed together. The result should be a pungent, head-clearing “salad” that I eat in between meals a half-cup at a time, a few times a day when experiencing symptoms. If you are familiar with kimchee, you know that it traditionally contains fermented fish sauce, so I leave this out, of course. My kimchee stays in my refrigerator at all times and will not spoil, so it can be kept on hand to have when needed. It’s a good thing I enjoy eating it. It’s great as a condiment on rice, but mixing it with other foods seems to lessen its punch for me. One more thing. It does cause garlic breath, so I brush and gargle with baking soda. It helps me so much with my candida and general immunity, that I’m not willing to give it up! I would like to suggest you add fermented foods to the remedies page. EC: Thanks for the suggestion - post away!